This is ridiculously simple, and possibly the easiest thing i've cooked in a long time. I've used sustainably sourced cod in this, but if you feel stongly about using cod, it is equally good with other firm, white fish such as tilapia, hake or even salmon. If you make the pesto in advance (I'll show you how to make this another time - it's really easy), this takes about 20 minutes in total to prepare and cook. Alternatively, use a good, fresh readymade pesto sauce and you should achieve similar results. Equally, you can buy readymade breadcrumbs, though these obviously don't have such a wholesome, homemade appeal. Serve with fresh green beans and a green salad. Preheat the oven to 200°C and fill a saucepan with about 3cm of water for the beans. Mix the pesto, breadcrumbs and parmesan together until it forms a sort of paste. 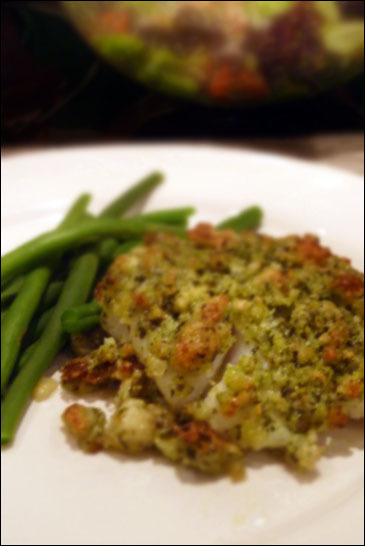 Place the cod fillets on a baking tray lined with foil and, using all the mixture, pat the pesto paste onto each piece of fish so that they are covered. Place in the oven for about 12 minutes to bake and bring the water for the beans to the boil. Once the water has come to the boil, put the beans on to blanch for 4-5 minutes. Remove the fish from the oven - the fillets should lightly flake apart; drain the beans and serve.